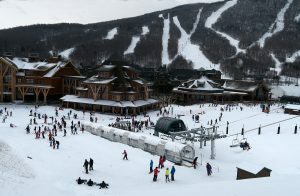 Stowe, VT – Stowe Mountain Resort’s stellar reputation as a skier’s mountain was built in part upon the steep pitch of its renowned Front Four trails. 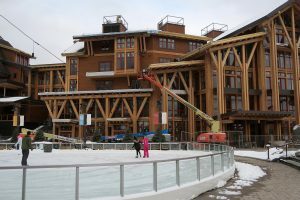 A decade-long frenzy of construction at its tamer Spruce Peak base area has put the northern Vermont resort on the map as a world-class, all-season vacation destination. True confession: I have never skied the double black foursome, but I have looked at them through a window at Front Four Private Residence Club at Spruce Peak and it’s much less intimidating than the view from the top of the trails. I’m guessing that despite lift line bravado, most snowsliders would also prefer to experience Goat, Starr, Liftline and National as a vision from the selection of comfy confines that about a half billion dollars of Stowe investment provides. Stowe is a two-mountain experience. As one drives towards the resort, Mt. Mansfield is on the left. Mt. Mansfield is the highest mountain in Vermont at 4,393 feet with a skiable vertical drop of about 2,360 feet. It is the home of the “Front Four” and other challenging trails, along with a selection of intermediate trails and the 3.7-mile meandering Toll Road for beginners. Workers in Franklin Roosevelt’s New Deal public relief program Civilian Conservation Corps cut trails on Mount Mansfield in 1933, putting Stowe on the map as a ski destination. Mt. Mansfield with its iconic red gondola is what one thinks of as the traditional Stowe ski experience. The Mt. Mansfield side is also where most guests park. Spruce Peak is off to the driver’s right. It has a vertical elevation of 3.390 feet with a skiable vertical drop of about 1,830 feet. Much of that skiing is on easy and intermediate rated trails. Spruce Peak is the center of much of Stowe’s investment in high end development. Parking at Spruce Peak is for those who pony up big dollars for a spot in an underground parking garage. A horizontal moving gondola named Over Easy connects Spruce Peak with Mt. Mansfield. Over Easy was completed in the winter of 2006-07 and replaced a system of school buses that united the two areas. 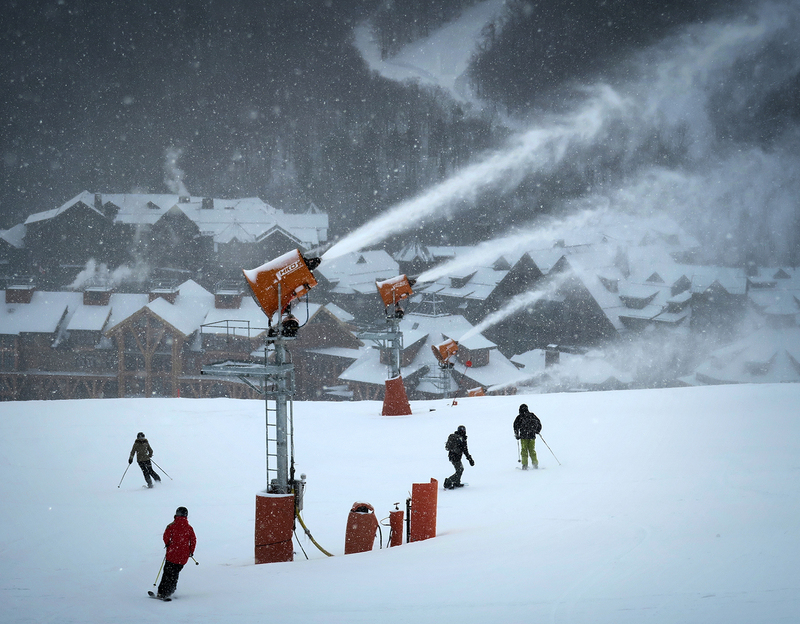 Between the two mountains there are 116 trails with 83 percent snowmaking coverage. The Vermont Ski Areas Association hosted a media day at Stowe last season and while Mother Nature cooperated for the day with cold temperatures and snowfall, the East Coast’s winter of our discontent put an exclamation point on the need for winter resorts to up their four-season game if they want to remain a viable business. Stowe representatives showed that they are on top of that game. Members of the media and Vermont snowsports industry representatives got an up-close, and at times behind the scenes look at just what a half billion dollars can buy. Some of that money went into snowmaking system improvements, which over the past two seasons added 445 HKD tower guns, 150 energy efficient land guns, 20 Super Pole Cat fan guns and seven miles of snowmaking pipe to Stowe’s arsenal. The Spruce Camp Base Lodge and the 312 room Stowe Mountain Lodge hotel and spa took shape in the first phase of new development at Spruce Peak. Both are high-end structures built and operated with attention to detail. At the base camp natty dressed staff is quick to bus tables in the cafeteria style eating area and the women’s rest rooms are stocked with complimentary hygiene products. 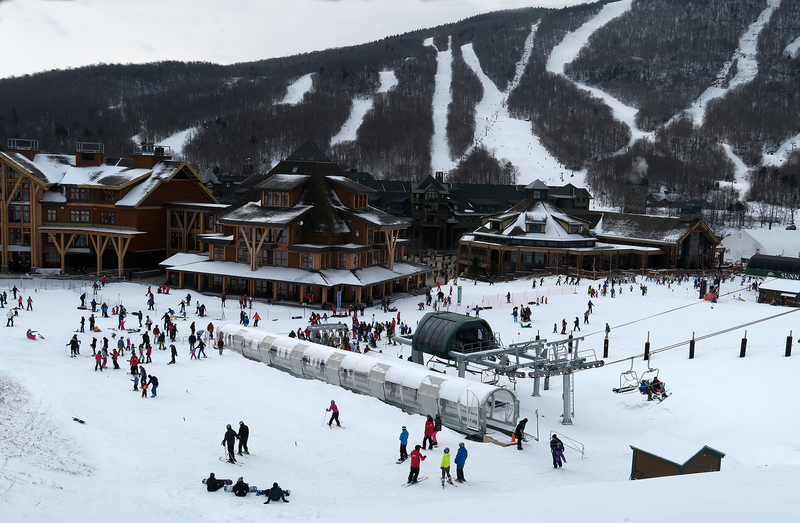 Stowe Mountain Lodge offers luxury dining, lodging and spa facilities. The lodge is home to the Front Four Private Residence Club with its own private concierge service and those great views of the Front Four. The 420-seat Spruce Peak Performing Arts Center opened at the base area in December 2010 with a week of popular artists including actor Ben Vereen, folk fiddler Eileen Ivers, southern gospel group The Spencers, and five-time Grammy Award winning singer/songwriter James Taylor in an education fund benefit concert. Taylor, an avid skier, returned to the Spruce Peak Performing Arts Center for a 2014 New Year’s Eve concert benefiting the Center. During the media tour, construction was nearing competition on a new building that this season houses the Stowe Mountain Club Alpine Clubhouse and a children’s Adventure Center with ski/ride school, year-round daycare facilities, and in the center of it all, a 42 foot-high, multi faced indoor climbing wall. Nineteen unique penthouse legacy residences top off the building. At the center of all the development is the Spruce Peak Plaza with retail shops and restaurants. A 9,000 square foot Rockefeller Center-style ice skating rink made its debut in the Plaza last season. The skating is free and skate rentals are available for a fee. A pavilion building with a huge fireplace has been built next to the rink. When winter is over the rink is removed and the area transforms into a town center. And when winter is over, the entire resort kicks into four season mode. An 18-hole mountain golf course designed by Bob Cupp opened in June of 2007. Summer Adventure Camp is available for children aged 3 to 12. Hiking from the Gondola is a popular activity and a new ZipTour Adventure includes several zipline options. For those who want more options than ziplines, TreeTop Adventure entails six different courses consisting of aerial tree-to-tree connections with 68 various elements intertwined in the experience. Tennis, biking and canoeing are among the other activities the keep Stowe ticking spring, summer and autumn. If the objective of Stowe management was to dazzle the media with what they had built, mission accomplished. 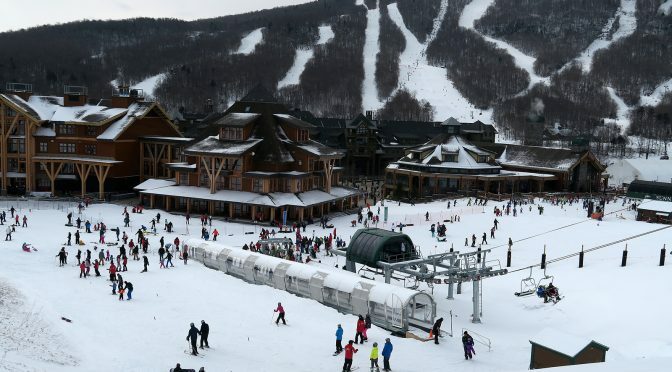 My ink-stained colleagues agreed that amenity wise, Stowe belongs in the same category as the big name western resorts that set the high-end standard.